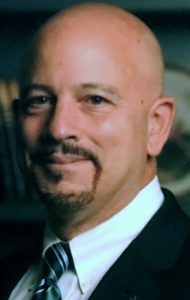 Francis S. “Chip” Errigo, 64, of Manheim Twp., passed away early Thursday morning, January 24, 2019, at home after a brief illness. Born in Lancaster, he was the son of Anna (Voci) Errigo and the late Francis S. Errigo. Chip was the loving husband of Judy (Mohn) Errigo, and together they shared 34 wonderful years of marriage. A devoted father, Chip dedicated his time to his daughter Katie, attending many horse shows and dog agility trials throughout the East Coast. He was a lover of music and played both acoustic and electric guitar since he was a child. Chip was a member of numerous bands during his lifetime. Chip was a 1972 graduate of Manheim Township High School and later attended Penn State University. He worked as a Compliance Officer for Susquehanna Bank in Lititz for more than 26 years, retiring in 2015. Chip became a known fixture in the town of Lititz, and made many friends during his daily walks through his beloved town. Carrying on his father’s legacy in photography, he founded a drone photography business during his retirement. He was also actively involved in two of his daughter’s business ventures. Chip enjoyed traveling and had fond memories of annual trips to Cape May, NJ and Palm Beach, FL. In May of this year, the family cruised from Seattle to Alaska in a once in a lifetime trip. In addition to his mother and his wife Judy, Chip is survived by his daughter, Katie Roering and her husband Eric of Mount Joy. Also surviving is his sister, Paula M. Errigo; a brother-in-law, R. Michael Mohn and his wife Christine; a sister-in-law, Sandra Thompson and her husband Gary; nieces Francesca Vaughn (Ryan Vaughn), Becky Crawford (Fielding Crawford) and Madison Mohn; and nephews, Andy Mohn and Matthew Thompson. In addition to his father, Chip was predeceased by a sister, Marie Errigo. A viewing will be held from 5-7 pm on Wednesday, January 30, at the Charles F. Snyder Jr. Funeral Home & Crematory, 3110 Lititz Pike, Lititz, PA, 17543. The Rosary will be recited at 6:45 PM. Family and friends will also be received from 10-11 AM on Thursday, January 31, at St. John Neumann Catholic Church, 601 E. Delp Road, Lancaster, PA, 17601, where a Mass of Christian Burial will be held at 11 AM with Rev. Dan Powell as Celebrant. Interment will be private. In lieu of flowers, memorial contributions in Chip’s memory may be offered to The Leukemia & Lymphoma Society at donate.lls.org. I am very sorry to hear of Chip’s passing. I worked with him for many years at Susquehanna Bank. We stayed in touch periodically on Linkedin after he retired. Chip will always be remembered for his kindness and willingness to go out of his way to help you. He had so much pride in his family. My thoughts and prayers are with Judy and Katie and his entire family. Peace be with you. I’m so sorry to hear of Chip’s passing. Like others leaving condolences, I had the pleasure of making friends with Chip while working at Service Merchandise years ago. Fond memories of working with him, Sam and the rest of the crew. Judy and Katie, I hope there’s comfort in knowing that Chip was loved by so many. My thoughts and prayers are with you and your family. He was an awesome person. I am so saddened to hear of Chip’s passing. He was such a great guy. A few months ago I ran into him at the Giant in Mount Joy. We talked for about 15 minutes. He was so proud of his daughter and son in law and their new business venture. Now every time I go there I will think of him – and miss him. My thoughts and prayers to his family. I am so sorry to hear about the loss of your beloved husband/father. I worked at Susquehanna Bank and while I didn’t work directly with Chip, I remember him as jovial and well-liked by many. We care deeply about our fellow Susq employees…please know that you and Chip are in our thoughts and prayers. Then as he became a man and a father so in tune with Katie ..
I’m so sorry to hear this heartbreaking and surprising news. He was such a sweet devoted man, and loved you all so much. I hope you can find some comfort in that, and just hold each other tight. Was very sad to read of Chips passing. I remember him at Service Merchandise and all the great parties we had. He also hooked up my first VCR, he was quite the electronics whiz. Always keep the memories close to your heart and he will always be with you. Judy and Katie I am truly sorry for your loss. I am honored and blessed to have known Chip. We worked together at Susquehanna Bank. He was truly a blessing in my life and I will miss him. My condolences. I was so sad to see that Chip passed away. I worked with him in the early 80s at GE Richards. He was always a very kind, sweet man. My heartfelt sympathies to Judy and Katie. I am so very sorry to learn of Chip’s passing. I know I join many others from Manheim Township HS who considered him one of the friendliest and most kind-hearted guys in our class of ‘72. My condolences and prayers for your family. Chip was a good friend and always had a smile and nice things to say about everyone. One of the truly genuine people with a great sense of humor, he was always one to downplay his many talents, particularly music and photography. Clearly he was gifted I’m many ways. I will always remember the many times we spent cracking up telling jokes or funny stories, both while at work and outside of the office. Farewell, my friend. You’re in a better place. I am saddened to hear of Chip’s passing. He was a kind and dear man, always had time to talk with us at dog agility classes and trials when Katie was competing. My sincere condolences to his family. He will be missed. Sincere sympathies to your family. Chip and I had lots of good times working together at Susquehanna over the years, lots of fun lunches and evenings out with the gang. He is gone too soon. I was a classmate of Chip’s at Manheim Twp. High School and we graduated together in 1972. During that time we became friends and shared many laughs together. 45+ years later we reconected through Facebook where I enjoyed seeing his photography posts. My heartfelt condolences to the family and all that knew him. RIP brother. I am so sad to learn of Chip’s passing. I was a classmate of Chip and he provided many photos for me when I was the Sports Editor for the high school newspaper. Several of us got together and perused one of his albums from that era over beers at the White Swan a couple years ago. I last heard from Chip when I was at the WWII Museum in New Orleans this past Veterans’ Day telling me several of his Dad’s photos were displayed there. He had been looking forward to visiting and seeing them. My condolences to friends and family. Larry and Barbara Fagan extend condolences to the family of Chip Errigo. We have know Chip for a number of years and he will be missed. Chip and I worked at the Lancaster Service Merchandise back in the late 80’s. It was great to reconnect via Facebook years later. We shared a love of photography & of dogs. Judy, I am so very sorry for your loss. Katie, he was so proud of your work with animals. I rescue Border Collies and when he noticed that he shared your passion for agility with me. Hugs Judy, Katie, Sam, Maryann and the rest of the family and friends. Rest in Peace Chip. So sad to hear of Chip’s passing. As one of my brother’s best friends in the teenage yearsand beyond, Chip was a staple at our house. We thought of him as another brother. Chip tolerated me, the youngest, better than most of Steve’s friends. In recent years I’ve run into him while he was visiting his dad here in our neighborhood (he is also greatly missed). Sad for your loss, and ours. I’ll be thinking of you. I really liked Chip. We worked together at Susquehanna Bank for years, he was in Compliance and I was in Audit and Risk. We would pass by each other during our lunchtime walks through Lititz, I learned much from him. We had a lot of common interests, Penn state, music, Lititz, CLL. I’ll miss him. He left us too soon. Chip – what a sweet man you were, always a smile on your face and a kind word for all. You will be remembered fondly and missed by so many! Our deepest sympathies to Judy, Katie and all of the family! Rest In Peace Chip – you left us way too soon! To the Errigo Family, you are in my thoughts and prayers at this most difficult time. I pray for peace in the moments when you need it most and strength to sustain you. May your cherished memories be forever in your heart. I was very sorry to hear about your husband and father’s passing. I always remember him as a very kind and friendly person. My deepest sympathy to you and your family.